A study abroad program is the perfect opportunity for you to experience life outside of your home country. With several study abroad destinations to choose from, you can now pursue your higher education in a country that best suits your needs and interests. 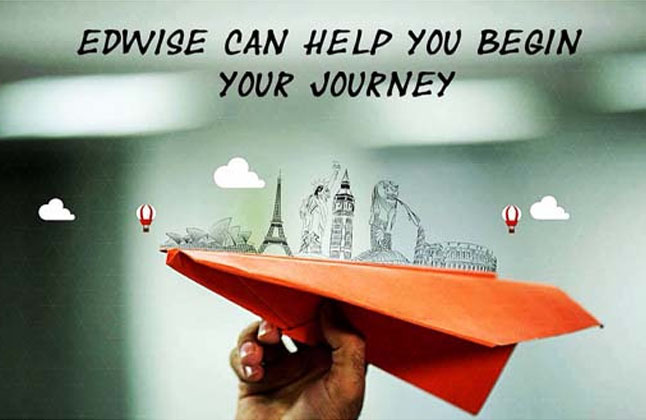 Edwise can assist you by providing you with endless services that will make the process of studying abroad an effortless one. One of the most important aspects of studying abroad is university selection. Our counselors at Edwise will guide you down the right path by mapping out universities for you based on your personal, academic and financial profile. At Edwise, we pay close attention to your application and ensure that you present one that is error free. In addition to assisting you with Reference Letters and Statement of Purpose, we also follow up with your chosen university for a positive and quick response. Applying for a higher education abroad can be a daunting task, and therefore our team of working professionals will guide you through the process of choosing a career that is both rewarding and fulfilling. Moreover, we also host direct interviews with university representatives and advice students on various study abroad options. With several careers to choose from, the confusion that students face when deciding on a career is understandable. The Academic Pathway Planning program highlights your strengths and weaknesses and will lead you towards your professional goals. Standardized testing is an integral part of your education overseas as the admissions office requires certain criteria for acceptance into a university. Coaching at Edwise offers personalized test prep based on adaptive learning and allows for flexibility of batches across all 23 locations in India. Edwise additionally provides thorough guidance in matters of financial loans & assistance. Our tie up's with reputed and nationalized private banks offer loans at reasonable rates. We also assist in the required paper work, and ensure that the eligibility criteria for these loans are met. AWe provide complete assistance on visa applications, this includes filling forms, preparing financial documents and guiding you on mock interviews. We are constantly updated with the visa requirements and regulations for all countries and ensure that your queries are answered promptly. Our team of professionals will assist you with flight bookings well in advance and will also inform you of ideal departure dates and routes. Moreover, our counselors will also help you choose an airline that offers excess baggage schemes and discounts. The World Education Fair organized by Edwise allows you to interact with university delegates from around the world. These fairs provide you with vital information on the programs and courses offered at these institutes, and will prove useful to your study abroad program. The Pre-departure seminar organized Edwise is an informative session that informs you on what to expect when in your host country. This session is beneficial as it will offer you the opportunity to meet students that will possibly be attending the same institute as you. We will also be providing you with an updated and comprehensive Pre-departure kit prior to your travel. It was an excellent experience to be a part of Edwise. My counselor guided me smoothly throughout my admission to visa process. Thanks a lot to Edwise they are doing a great job. I will suggest Edwise to my friends so that everyone will benefit from their services. The experience with Edwise was like being with Family, I was never treated as an applicant, they always made me feel a part of them. Anyone who wishes to fulfil their dreams should come to Edwise. Edwise has given me the opportunity to study overseas, not only were they helpful to sort my application, visa paper work but also helped me to get my accommodation sorted!! They have helped me all throughout my application process! Specially my Counselor in charge of the UK department was extremely helpful, she gave me guidance from step to step!! Therefore, I would strongly recommend Edwise to anyone who is looking for a successful overseas application with a personal guidance!!! Edwise is an extremely professional and fast processing consultancy. My visa which wasn't getting sanctioned through the other consultant was very quickly sanctioned by Edwise.It was like a breeze that the process started and completed too. Apart from Visa the counselling, coaching and everything was carried out very well by edwise.Keep up the good spirit EDWISE! !